I’ll be honest, I’ve never been at King of Fighters fan. I don’t know why, I love beat em ups, and SNK’s fighters are the most polished out there, I just never saw the appeal. The fighters look rather samey (with a few exceptions), and it all seemed a little slow and forced. It’s probably the same reason why I don’t like Virtua Fighter. I am a sucker for speed, something that Street Fighter & Mortal Kombat delivered in droves, and I just had problems with this game. So it with great trepidation I tried out the latest game in the King of Fighters series. 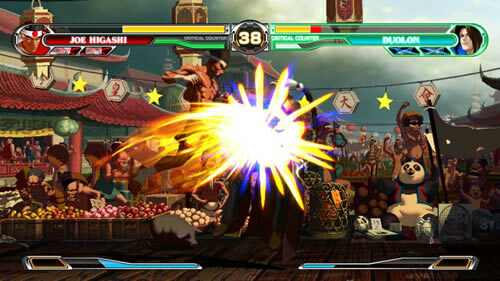 King of Fighters XII is the latest game in the series, and it’s out now on Xbox 360 & Playstation 3. The polished nature of the gameplay is here in droves. The game has had a complete makeover from the last time I saw this game in the mid 90’s. All characters have been redrawn in a cel shaded style, and animation on the characters is really polished. It is actually a really enjoyable beat em up, when you get used to it. The collision detection is spot on, the “Critical Counter” I really like, as it gives you a chance to unleash a hellacious combo, and whilst the music isn’t memorable, it isn’t exactly annoying. Yes the presentation of the game is pretty good, and it’s a good beat em up, it’s just rather frustrating at times. 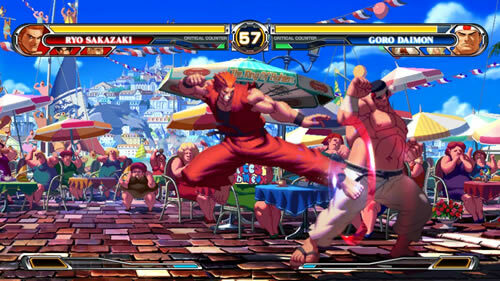 You have Arcade mode, which is the main portion of the game. In it you pick the usual 3 characters from a selection of 22 (the lowest in any KOF game) and you have to defeat other teams. This is frustrating and confusing as it’s known as “Time Attack Mode”, and you have to basically “score the biggest time to win the tournament”. Why it’s frustrating is that you only have to beat 5 other teams to win the game, and it’s not particularly hard. It seems focussed on more on completing the game as quickly as you can rather than actually requiring any skill. No boss, no real end story more than a short FMV of “Wow, that was a good tournament!”, and a few achievements unlocked. Not really fulfilling. Secondly, the practice mode is really not worth playing. Lets be honest, the only reason to play practice is to learn the moves. Is there a move list accessible from this mode? No. Which is a shame, as you can see it from everywhere else in the game, including in online mode. Speaking of online mode, it is a bit of a chore. It seemed rather slow and unplayable – which may be because of my 1 meg connection, but if Street Fighter can handle it without any slowdown, why can’t this? It’s very frustrating as well if you’re a spectator, as there’s no real way to quit it unless catching the game in the split section before the next game starts. Otherwise it’s a “Return To Dashboard” jobby. There is one saving grace, the Versus mode, which is either 1 v 1 or 3 v 3, and the typical winner stays on upto 8 players, you can also stick computer players in there. Really it’s the only way to play the game after completing it once. It is really not a bad game, the game itself it’s very polished, and rather enjoyable with friends, but the overall presentation really lets it down. King of Fighter players will buy this, and should, everybody else should wait until it’s a little cheaper or pick it up second hand. King of Fighters XII is released on 25th September 2009 for £39.99 and available for the Playstation 3 and Xbox 360.